It doesn’t seem like the Prince’s work will ever end. Once again The King of All Cosmos is in need of your ball-rolling skills to collect enough worldly items to create more stars in the sky. The King recently took a blow to the ego when being compared to a school principle, so something must be done to make the King cool once again. Yes, you will certainly be able to use the touch screen to roll the Katamari, though if you’re more comfortable with the classic controls, the two analog sticks are at your disposal. One noteworthy addition is the ability to stretch and squeeze the Katamari by using the rear touch pad. It is less of a gimmick and more of an opportunity for Namco Bandai to introduce level designs that haven't appeared in past games. Get creative enough and you can pick up more items than you normally would with a regular shaped Katamari. This was one of the games I played at a loud and crowded Vita media event in San Francisco, and it was only one of three titles where I insisted on hearing the audio through headphones. 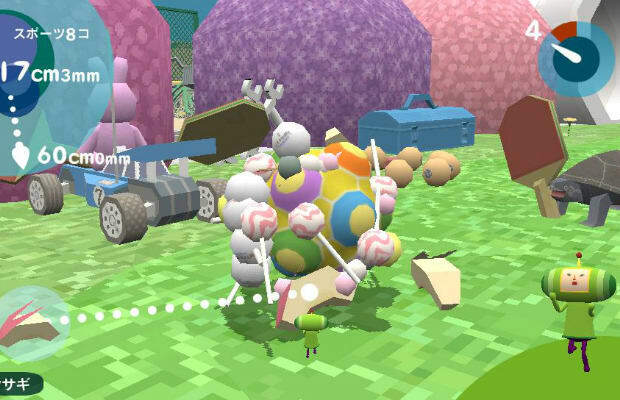 Having bought the soundtrack of the original game, it was pleasing to hear that Touch My Katamari’s soundtrack has the potential to be equally catchy (I only played for 10 minutes).